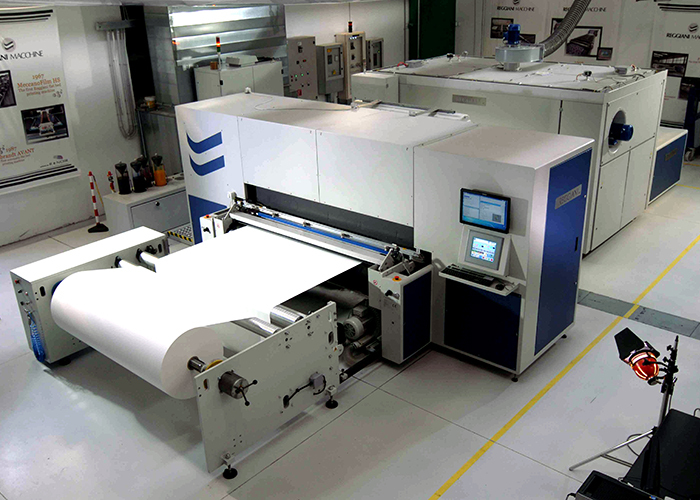 EFI has established an industry-leading presence in high-growth inkjet textile printing with the strategic acquisition of ReggianiMacchine. Based in Bergamo, Italy, Reggiani is a leading technology provider with an extensive line-up of industrial inkjet printers uing water-based inks in printing on fabric, an area recently identified as the industry’s most exciting growth application by a new, global survey from industry association FESPA and analyst firm InfoTrends. Reggiani’s inkjet technologies, which will be rebranded as EFI Reggiani, address the full scope of advanced textile printing, with versatile printers suitable for water-based dispersed, acid, pigment and reactive dye printing inks. In its 60 plus year history, Reggiani has become a leading innovator of a full range of industrial solutions for textile manufacturing, including high-quality printers for fashion and home furnishing textiles, with a comprehensive portfolio spanning the company’s original rotary screen technologies to the most advanced inkjet textile printers and inks in the industry. Reggiani has also established relationships with many of the leading textile manufacturing companies around the world and provides an integrated offering including equipment for all stages of the textile printing process, centred around its leading digital inkjet textile printers. EFI CEO Guy Gecht said: “This acquisition gives us an immediate leadership position in one of the world’s largest industries undergoing the transformation from analogue printing to digital. The textile printing market is just beginning that transition, which will enable manufacturers to shift from long-run to on-demand manufacturing, responding to the increasing demands of short runs and customisations. Former Reggiani shareholder AmbrogioCacciaDominioni, who will be Managing Director of EFI Reggiani,added: “Reggiani’s customers recognise that inkjet is the most important technology of the future for the textile industry,but I wanted our company to be part of EFI not just because we will be joining a world-leading industrial inkjet technology company, but also because EFI is a leader in print industry workflow solutions and has a much larger sales and marketing platform around the world. Reggiani has customers in more than 120 countries served by a wide distribution network and agents in over 40 countries. To acquire all of Reggiani’s outstanding shares, EFI will repay Reggiani debt of about €20.1 million ($22.6M USD*), pay the former Reggiani shareholders up to about €27.4 million ($30.8M USD) of cash, and issue the former Reggiani shareholders up to about €27.4 million ($30.8M USD) of EFI stock, and will pay up to €50 million ($56.2M USD) over as long as the next 30 months, based on the achievement of revenue and profitability targets by the EFI Reggiani business. Under certain circumstances, EFI is required to pay in cash some or all of the amount described above that is payable in EFI stock. Reggiani’s work force of approximately 190 employees joins EFI, thus further expanding its growing worldwide presence.